Eoltech, an independent wind energy consulting firm, has announced that it won contracts from major French customers to deploy IREC-Index. With this advanced multi-source wind energy index, Eoltech will aim to refine the monitoring of 24 wind farms in France, representing a total output of 500MW. IREC-Index will enable Eoltech’s clients to check the consistency of their fleet’s output against the available wind resource to detect potential turbine performance discrepancies. The specificity of IREC-Index is to be based on the selection and combination of several data sources that are both independent and coherent with one another. This multi-source approach reinforces the consistency and robustness of this energy index while addressing the challenge of managing data homogeneity in time. For each region, IREC-Index takes into account at least four distinct and independent sources of wind data, whose consistency in time is checked each month. These data are then converted into production and combined to obtain robust output reference indicators by region, providing valuable information to operators wishing to optimise the energy performance of their wind portfolio. “Most players involved in the monitoring of the power output of wind farms are looking for databases providing high correlation levels with their production data. But even if this condition is important, it is not a guarantee of reliability, because consistency in time is generally not taken into account. By combining several independent sources, the IREC Index approach can filter out inconsistent sources and increase the robustness of the results while ensuring that a high correlation level with production data is maintained,” explained Habib Leseney, CEO of Eoltech. 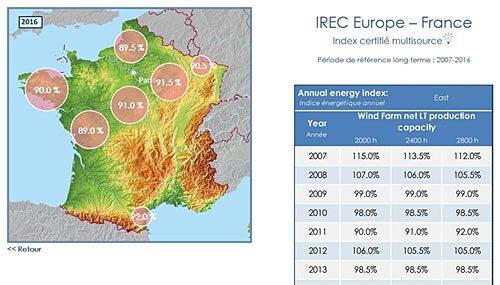 Since its creation in 2010, IREC-Index has been tested and validated on more than 130 wind farms, representing 1,600 MW, with an average correlation level of more than 97%. These rigorous test campaigns have demonstrated its superior level of accuracy, ease of implementation and ability to improve production control processes.